In which film’s climax did a mother shoot her own son dead for the sake of a woman’s honor (he was abducting her)…a couple of years before Mother India was made? Carla’s review of Mother India brought this one to mind. Madhu is the only person who knew this one! The film is Munimji (1955) starring Dev Anand and the gorgeous Nalini Jaywant, along with Nirupa Roy and Pran. 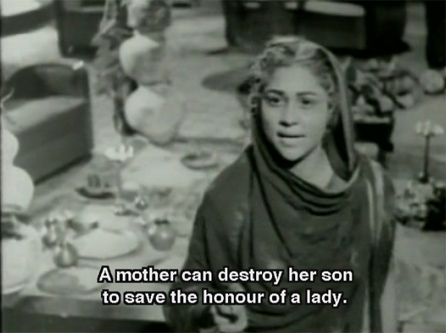 Nirupa Roy was only 24 (as Madhu points out in her comment) but played Pran’s mother. Madhu also told me that she won a Best Supporting Actress Filmfare award for this performance, which makes me shudder. She played a weepy, unworthy-son-worshipping Ma at its very worst, but the songs in the film and the romance between Dev Anand and Nalini Jaywant make it worth watching. Plus, she did come through at the end, and Pran got his just desserts. Posted on July 8, 2008 at 11:08 am in Hindi movies, Trivia time	| RSS feed You can skip to the end and leave a reply. Wasn’t this Munimji? Nirupa Roy acting as Dev Anand’s foster mother and Pran’s mother – I think she was only 24 at the time! Hm, there was a film mentioned in the comments to my *Mother India* post that sounds like it could be the right one, since it’s apparently close to *Mother India* in a number of ways. Oh baba, I have a lot of catching up to do with you people. I am getting Teja and Dhanno hooked to the good B/w oldies. Madhu, you are correct :-) I thought this would stump people, but I’m always glad when it doesn’t! Carla, I think the film you mean from the comments is “Aurat” which Mehboob Khan made almost a decade before “Mother India”…I haven’t seen it, although I would like to. The movie is Tangewali (1955) where Nirupa Roy shoots her wayward son Shammi Kapoor and which preceeded Mother India (1957). Aurat was remade as Mother India. Apprently Aurat was not a commercial success.